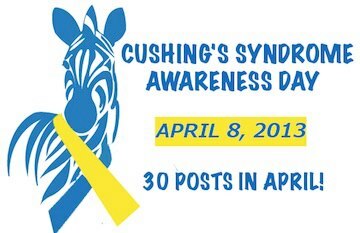 2013 Cushing's Awareness Blog Challenge! 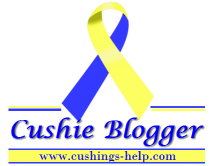 I am once again planning to participate in the 2nd Annual Cushing's Awareness Blog Challenge! Cushing's Awareness Day (and Harvey Cushing's birthday) is on April 8th, so that is why we are doing the blog challenge in April. I loved doing it last year, and there is a big list of topics, most of which I did last year. I don't want to repeat a lot of them, so do you have any ideas of blog topics related to Cushing's you would like to see? Let me know! I'll be counting down to April! If you would like to participate in this blog challenge, please click here to find out how! Idea for a topic: I am curious to know if you notice a difference in how people treat you now that you've lost so much weight as opposed to how you were treated when you had full blown Cushing's. This would include acquaintances and even strangers. Topic Idea: Do you have loose skin? If so do you see yourself having surgery for it? Awesome idea! We think alike - I was thinking of doing something on this!